Journey’s Neal Schon was at the recent NAMM (National Association Of Music Merchants) show to promote his new line of PRS signature guitars. Schon sat down with David "Gus" Griesinger of BackstageAxxess.com to talk about the new gear; watch the video interview below. Neal developed two distinct signature models: the NS-14 and NS-15. Schon was intimately involved in the design of nearly every aspect of these instruments…from the stylized f-holes to the hardware details. The NS-14 is a completely new PRS design incorporating a 14” semi-hollow singlecut body with a new neck joint designed to allow greater access to the higher frets. The NS-15 is a thinline hollow body based on the Neal Schon limited edition Private Stock guitar offered in early 2012. A portion of Neal’s signature tone comes from his long-standing use of Floyd Rose tremolo systems. 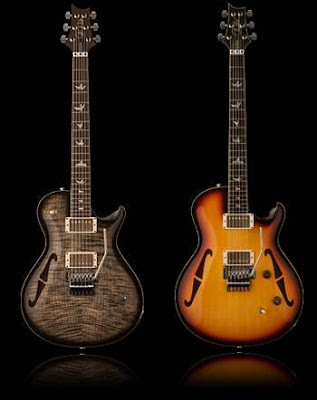 The NS-14 and NS-15 add a Floyd Rose to the PRS Core line for the first time. Schon release his latest solo album, “The Calling,” last fall and continues to tour with Journey.